The advantages provided by cubic boron nitrates abrasive tools over the tools made of diamond have surfaced as the key factor behind the substantial growth of the global cubic boron nitrates market. Although diamond is the hardest material used for industrial operations, such as turning, cutting, drilling, boring, and grinding, it has several technological limitations. Cubic boron nitrates, on the other hand, can overcome the issues faced by diamond and maintain its hardness at room temperature as well as over a wide range of temperatures, making them sturdy and more dependable. With the increasing demand for cubic boron nitrates across the world, the opportunity in this market is estimated to rise at a CAGR of 7.10% from 2016 and 2024, increasing from US$531.3 mn in 2015 to US$978.9 mn by the end 2024. Although the market looks promising at present, the expensive production process may create obstacles in the growth trajectory of this market in the years to come. Inserts, wheels, mesh, and powder are the main products available in the global market for cubic boron nitrates. Among these, the demand for inserts is higher than others and is anticipated to remain so over the next few years. The increasing application of inserts in the metal processing industry, owing to the rising requirement of processes, such as cutting, grinding, and finishing for products in the automotive, medical, and the aerospace sectors is expected to boost the demand for inserts across the world in the near future. As a result of the increasing utilization of inserts in cutting and grinding applications, the demand for wheels is likely to decline noticeably over the next few years. Among applications, the demand for cubic boron nitrates products is significantly high in the cutting and grinding segment. Latin America, North America, the Middle East and Africa, Europe, and Asia Pacific are the key geographical segments of the global market for cubic boron nitrates. Asia Pacific led this market in 2015 with a share of 35%. Analysts expect this regional market to remain leading over the next few years, thanks to the presence of a large number of market players and the extensive demand for cubic boron nitrates in various Asian economies, China, India, and Japan. The significant growth in the automotive, medical, and the aerospace industries observed in developing countries will also support the Asia Pacific market for cubic boron nitrates in the years to come. Among other regional markets, Europe is likely to remain witnessing a steady rise, whereas, Latin America and the Middle East and Africa are expected to experience moderate growth due to the dearth of manufacturing facilities and their export-oriented economies over the forthcoming years. With the presence of a large pool of players, the global cubic boron nitrates market displays a competitive landscape. REX-LEE, FUNIK Ultrahard Material Co. Ltd., Sumitomo Electric Industries Ltd., Sumitomo Electric Hardmetal Corp., ILJIN Diamond Co. Ltd., Asahi Diamond Industrial Co. Ltd., Tomei Diamond Co. Ltd., SHOWA DENKO K.K., Reishauer AG, Baltic Abrasive Technologies, Element Six, NanoDiamond Products, Sandvik AB, Advanced Abrasives Corp., Saint-Gobain, and 3M are some of the leading players in the worldwide market for cubic boron nitrates. Cubic boron nitrates (CBN) is a synthetically manufactured material, which is second to only diamond in hardness. One of its common synthesis processes is direct conversion of hexagonal boron nitride to CBN by treating at high pressure and temperature. CBN abrasives possess characteristics that exceed the values of conventional abrasives; for example, high strength and hardness, resistance to chemicals, heat, and abrasion; and ability to maintain the sharp cutting edges during use. The report estimates and forecasts the cubic boron nitrates market on the global and regional levels. The study provides forecast between 2016 and 2024 based on volume (tons) and revenue (US$ Mn) with 2015 as the base year. The report comprises an exhaustive value chain analysis for each of the segments. It provides a comprehensive view of the market. Value chain analysis also offers detailed information about value addition at each stage. The study includes drivers and restraints for the cubic boron nitride market along with their impact on demand during the forecast period. The study also provides key market indicators affecting the growth of the market. The report analyzes opportunities in the cubic boron nitride market on the global and regional level. Drivers, restraints, and opportunities mentioned in the report are justified through quantitative and qualitative data. These have been verified through primary and secondary resources. Furthermore, the report analyzes substitute analysis of cubic boron nitride and global average price trend analysis. The report includes Porter’s Five Forces Model to determine the degree of competition in the cubic boron nitrates market. The report comprises a qualitative write-up on market attractiveness analysis, wherein end-users and regions have been analyzed based on attractiveness for each region. Growth rate, market size, raw material availability, profit margin, impact strength, technology, competition, and other factors (such as environmental and legal) have been evaluated in order to derive the general attractiveness of the market. The report comprises price trend analysis for cubic boron nitride between 2016 and 2024. 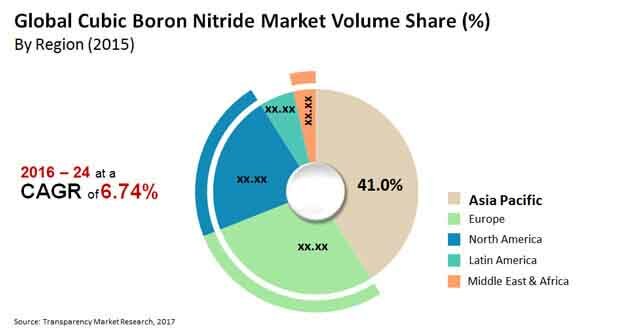 The study provides a comprehensive view of the cubic boron nitrates market by dividing it into product, application and geography segments. The products have been segmented into inserts, wheels, mesh and powder. The applications are segmented into raw abrasives, coatings, cutting & grinding, lapping & polishing, and others. These segments have been analyzed based on historic, present, and future trends. Regional segmentation includes the current and forecast consumption of cubic boron nitride in North America, Latin America, Europe, Asia Pacific, and Middle East & Africa (MEA). Market segmentation includes demand for consumption in all the regions individually. The product segment includes compounds of strontium such as inserts, wheels, mesh, and powder. Inserts are widely and predominantly used in cutting and grinding processes. Their shape, size, and content of CBN is determined by the processes in which they are expected to be employed. Powder is used as a raw material for manufacturing bonded abrasives, coated abrasives, polishes, cleaners, abrasive tools, grinding pastes, and other abrasive products. The application segment includes raw abrasives, coatings, cutting & grinding, lapping & polishing, and others. CBN is an extremely hard material and hence widely used as an abrasive, specifically in high-temperature applications. It is also widely used to coat a grinding wheel for fine grinding and lapping applications. Since the cutting and grinding of hardened and carbide steel is difficult, CBN powder or mesh, in the form of a coated surface over a grinding or polishing wheel, is used to perform finishing processes such as polishing, grinding, and lapping. CBN is a synthetic material produced by treating hexagonal boron nitrates (hBN) at high pressure and temperature. This process is similar to the production of synthetic diamond from graphite. The pressure range required for the process is high; however, this range can lowered by addition of boron oxide during the reaction. Sometimes, catalysts such as lithium, potassium, or magnesium and their nitrides and/or fluoronitrides are also required. To avoid growth of hexagonal phases or structures during explosive shock wave method or crystal growth in a temperature gradient method, boron trifluoride is added. These factors make the CBN manufacturing process expensive, which can act as a restraint to the market. Use of CBN has been increasingly recognized in ‘tool and cutter’ grinding applications as well as mass production grinding operations carried out in industries such as automotive, general engineering, and aerospace. CBN tools are more advantageous in comparison to traditional abrasives, which acts as a driver for the CBN market. Secondary research sources that were typically referred to include, but were not limited to, European Powder Metallurgy Association (EPMA), Metal Finishing News (MFN), Unified Abrasives Manufacturers' Association (UAMA), Federation of the European Producers of Abrasives (FEPA), company websites, financial reports, annual reports, investor presentations, broker reports, and SEC filings. Other sources such as internal and external proprietary databases, statistical databases and market reports, news articles, national government documents, and webcasts specific to companies operating in the market have also been referred for the report. The report covers detailed competitive outlook that includes market share and profiles of key players operating in the global market. Key players profiled in the report include 3M, Saint-Gobain, Element Six, NanoDiamond Products, Sandvik AB, Tomei Diamond Co. Ltd., Show Denko K.K., ILJIN Diamond Co. Ltd., and Asahi Diamond Industrial Co. Ltd. Company profiles include attributes such as company overview, number of employees, brand overview, key competitors, business overview, business strategies, recent/key developments, acquisitions, and financial overview (wherever applicable).